On June 30th, the Jens Jensen designed, century-old Garfield Park Conservatory, one of Chicago's crown jewels, suffered major damage from a severe hailstorm. 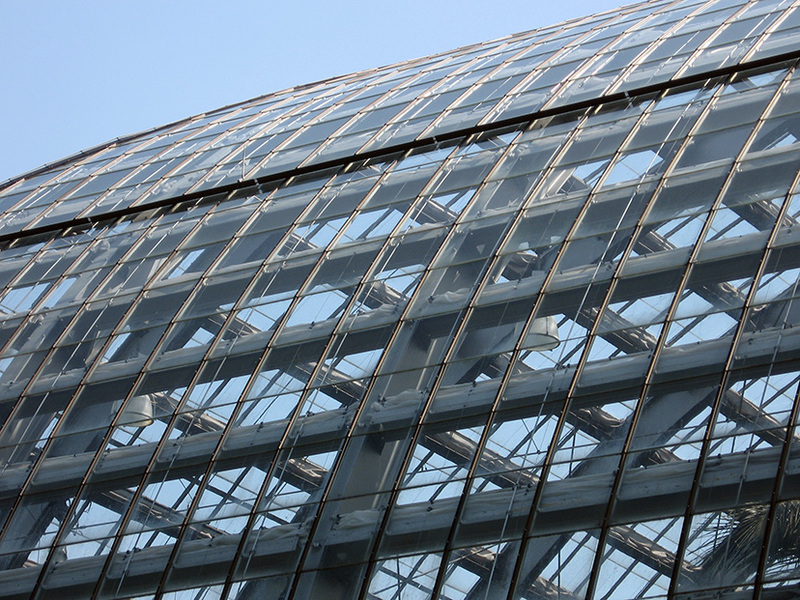 A major 1994 renovation resulted in several larger rooms, including the great Palm house, being reglazed a stronger, laminated glass that withstood the storm. In other parts of the complex, however, the glass is up to half a century old, and the much thinner panes sustained the bulk of the damage. 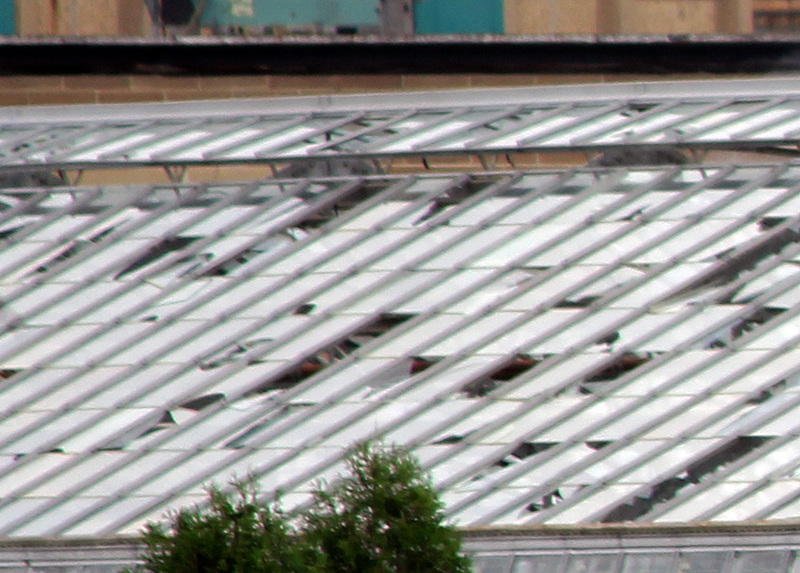 One estimate reported that up to 70% of the panes in the Fern room were damaged. That room, and in the Show House, Desert House and nine propagation houses, which provides thousands of plants annually to Chicago parks, are, according to the Conservatory's website, "covered with broken glass, and shards of glass hang dangerously from the roofs. Until the roofs are repaired, rain will cause the ponds to overflow, and direct sunlight will destroy and kill the plants that have been so carefully and lovingly conserved for so many years." In addition, there are a number of benefits being held to support the cleanup. This Sunday, August 21, from 12 noon to 4:00 p.m., Big Star Taqueria and Bar at 1531 North Damen will be holding a Everything but the Kitchen Sink sidewalk sale selling used and undamaged dishware, furniture and kitchen supplies from the Blackbird group of restaurants, including Blackbird, Publican, Violet Hour, Big Star and Avec. 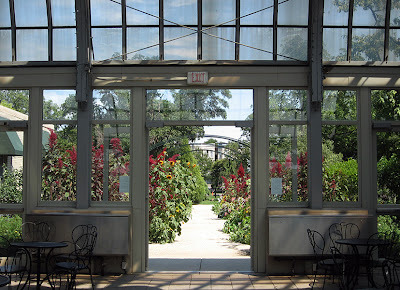 Thursday, September 1st, 5:30 - 8:00 p.m., Lincoln Park Zoo's Wine and Wildflowers event will also benefit the restoration of the Garfield Park Conservatory, and will feature Chicago Park District historian Julia Bachrach. Tickets, which must be reserved by August 29, are $95.00, and they can be purchased on-line. And tomorrow evening, Thursday, August 18th, Lincoln Hall, 2424 North Lincoln, will hold an 8:00 p.m. Garfield Park Conservatory benefit (tickets $20.00) featuring Bobby Conn, Del Rey, Sunken Ships, Bare Mutants, Rivals of the Peacemaker, and DJ Scary Lady Sarah, which, remarkably, are also all the names of varieties of orchids. Property damage cannot be avoided in the face of natural occurrences like hailstorms and earthquakes. For important local landmarks like the Garfield Park Conservatory, it is hoped that its restoration is carried out with the help of the local community.